We are very excited to be blogging and sharing all things property restoration related. If youâ€™ve never heard about us, let us introduce ourselves. We are a water mitigation and mold remediation service that provides top notch services at fair rates, 24 hours a day, 365 days a year. We hope that you choose us to provide courteous and effective flood restoration services if you ever encounter water damage in your home or business. 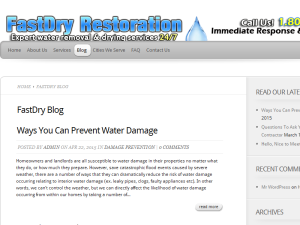 This what your Water Damage Tips by FastDry Blog Ad will look like to visitors! Of course you will want to use keywords and ad targeting to get the most out of your ad campaign! So purchase an ad space today before there all gone! So what does this mean if you happen to be a resident of California? Simply put, it means rain. And lots of it. Some predictions go as high as 35 inches of rain during the rainy season of 2015-16. While this event should definitely help with the particularly brutal 4 year drought California is in the throes of, California wont be “out of the woods” completely, so to speak. Another problem, that will be pronounced in the much dryer and more arid region of Southern California, is that due to the drought causing the soil/terrain to become extremely hardened, flash flooding will be unavoidable and widespread. Taking all of this in mind, any rational, forward thinking Californian should take the time and effort to make some preparations for the coming ‘Godzilla’ El Nino. There are a number of things any homeowner can do reasonably easily to protect their own personal safety, as well as their home, yard and vehicles. Around the house you can check windows, doors, gutters, the roof and any other part of your home that could have cracks or leaks which could let water in during heavy rain and/or flash flooding. Mesh guards can be installed to gutters and weatherstripping to doors and windows. Look for rusty spots on the metal flashing which indicates leakage. Outdoors, California residents can trim trees in their yard to prevent property damage from broken limbs due to torrential downpours and wind gusts. Check all drainage areas and the irrigation system for any type of blockages. Sometimes sewer systems can get clogged, so preventative measures such as sandbagging patios and entryways can help deter flood water intruding into your property. It is prudent to make sure all your vehicles have tires with good traction and windshield wipers that work. Roadways may become flooded in certain stretches and be treacherous to navigate. It is best to stay off the road during severe weather, but if you must, check local T.V. channels, websites, weather apps and other media sources to find out about weather and travel warnings in place. Preparation only can do so much, so if your home does get flooded, it is important to have contact information on-hand for a competent local emergency flood cleanup company to call once the storm surge has subsided. This years potential ‘Godzilla’ El Nino will be a bitter sweet event for California if it comes to fruition to the degree that many experts have predicted. On one hand, God knows we need relief from the historical drought Californians are enduring, and all the precipitation we can get would help. But on the other hand, the drought conditions of the region are perfect for widespread flash flooding, mudslides and road washouts. Whatever happens, you can’t affect the weather, but we can affect how prepared you are in case of flooding. Do you live in a flood plain or area that is prone to being flooded? If you answered yes to that question than I highly recommend that you take a few minutes to read this article. It may mean the difference between manageable repairs and total devastation after a flood event. Most of the time, flooding occurs in parts of our country that have a history of flooding, but occasionally flooding will happen in a region that is typically arid and dry. You never know with natural disasters; they can strike any time and any where they please. Of coarse, hurricanes are a major flood “offender”, but heavy rain and severe weather also cause rampant flooding by way of creeks, rivers, lakes, storm tides, mud slides, inlets and streams. Major flooding takes a big-time toll on it’s victims not only because of property damage, but also financially, emotionally and medically. When flooding causes homelessness, it can cause devastating shock and emotional trauma to those it displaces. There is no amount of preparation that can make you completely immune to the affects of flooding, but at least it can help you survive it and recover from it in a manageable fashion. It is important to first understand the unique risk to the region you live in and inquire about the existing emergency flood protocol and plans that have been set in place by the local, state or federal authorities. On the home front, you should always have an emergency disaster survival kit and have emergency numbers locked into your favorites in your cell phone. Once flooding is imminent, it is time to go into safety mode. Get all dangerous/hazardous, and valuable items off of the floor and up as high as you can store them. Get all sensitive items, (like legal documents, phones, family heirlooms, etc.) enclosed in water proof containers. If possible, dig trenches to create water path diversions away from your home and use sandbags to create barriers around entry points of your home. During the flood event, make sure and pay attention any emergency broadcasting that is giving warnings, advice or instructions to the public. Be prepared to abandon your home if the authorities have issued evacuation orders due to the high level of danger to citizens. Before you leave, grab your phone and valuables, put sand bags in your toilet bowls to prevent sewer backflow, and lock the doors. We hope you never actually do experience a flood catastrophe, but if you do we hope our tips will come in handy. Before we get into how to know if you have an issue with mold in your home, let’s first go over the basics. Mold is cause by microbial growth on or in materials in a structure that has high humidity/moisture levels and/or above average temperatures that are conducive to mold spore growth. Mold is not necessarily a bad thing in general, because it is a natural part of the environment that plays a crucial role in organic break down of natural materials that then, in turn, creates the circumstances necessary for new organic life forms to develop. On the other hand, inside of man made structures, mold is indeed a bad thing and should be avoided and dealt with immediately if discovered. Mold can begin growing in a structure that has water damage if drying is not begun within 24-48 hours. Mold begins as tiny spores that are invisible to the naked eye and are in the air are present almost everywhere, indoors and out. However, it is when these tiny spores land on something wet, that they begin to reproduce. So, now that we know the basics, how do we know if we have a mold problem in our home? Usually the most obvious warning sign is the appearance of mold. Many times, mold is able to be seen by the naked eye in visible areas that are easy to spot: bathroom walls, showers, behind toilets, under sinks, around water heaters, etc. But if you have reason to believe you may have mold but can’t see it, you may want to have a home inspector or mold testing company come to your property to check harder to find areas, like crawl spaces, attics, and basements. What does Black Mold (the most common type found in homes) look like? Black Mold, or Stachybotrys Atra, is a toxic species that appears as slimy and usually has a black or dark-green coloration. This type of mold is particularly dangerous and harmful to both humans and pets that come into contact with the mycotoxins produced by it. Another warning sign is the smell that mold produces. It has a strange and pungent odor that often is isolated to the areas that it exists within the home. The tricky part to knowing for sure if you are smelling it is that it often will not be visible. It often will grow in non-visible places like behind wallpaper, behind cabinets, or inside of walls. If you continue to notice strange smells in certain areas of your home, I would recommend bring in professional mold experts to further investigate the cause. The final and least desirable way to tell you have mold is that you are experiencing health issues. In many unfortunate cases, people will be living in a home with mold growth for months or even years without knowing it because it is not visible to them. The majority of the time that this happens, the residents will begin developing health problems such as congestion, watery eyes, feeling light headed and shortness of breath. If you think this may be happening to you, take notice next time you leave your house. If you feel better virtually as soon as you leave the house, then it is very probable that you have mold damage in your home, and you should immediately call in a certified mold removal company. I hope that you don’t have any of these issues, but that this has still served as a good lesson in case something arises in the future. Homeowners and landlords are all susceptible to water damage in their properties no matter what they do, or how much they prepare. However, save catastrophic flood events caused by severe weather, there are a number of ways that they can dramatically reduce the risk of water damage occurring relating to interior water damage (ex. leaky pipes, clogs, faulty appliances etc). In other words, we can’t control the weather, but we can directly affect the likelihood of water damage occurring from within our homes by taking a number of preventative steps to a avert common forms of interior flood damage. Following are some of the most common causes of internal water damage and corresponding preventative measures that any forward thinking property owner or manager would benefit from. Water heaters are one of the parts of a home that are usually neglected until there is a problem, because, as the old adage goes, “out of sight, out of mind”. The majority of water heater leaks or bursts occur towards the end or after the manufacturers warranty is up, which is on average is 12 years. We recommend that property owners schedule water heater inspections every 2 -3 years, starting towards the end of the warranty expiration; and then every 1-2 years after expiration. Proper function and life expectancy can also be sustained through consistent maintenance and flushing out of sediments that build up in water heaters. One of the easiest types of water damage to prevent is washing machine leaks. Over half of washing machine water damage losses reported are caused by rubber hose failures and faulty installation. Average rubber hose life expectancy is three to five years, so they should be replaced every three or four years to be safe. Look for aftermarket reinforced rubber hoses when you go to replace them and when you move the washing machine unit back into place, keep at least five inches between the back of the unit and the water hook up. Sewer backups are one of the less common causes of interior water damage, but they can be one of the most unpleasant types as well. Sewer backups usually originate somewhere between a property’s drainage pipes and the city sewer lines the run under the streets. Obviously, you can’t control municipal sewer functions, but you can take the preventative measure of hiring a qualified plumber to install a backflow prevention device into your property’s sewer system. Other less common causes of sewer backup are roots from trees that are too close to your drainage lines, and end up rupturing them so make sure there are no large trees within 10-20 feet. There are a number of other types of interior water damage and preventative steps to take, so check back soon to our blog for more! We hope these water damage risk reduction tips have been beneficial to you. Does your company hold water mitigation certification with the IICRC (Institute of Inspection, Cleaning and Restoration Certification)? The IICRC is the training and certification agency that is the foremost authority for the water restoration industry’s best practices and guidelines. If the flood services contractor you are talking to doesn’t have IICRC certification then their is a very high probability that they are not going to properly cleanup and dry down your home, and it will only be a matter of time until you have an even bigger mold/microbial problem on your hands. Properly trained technicians will know how to thoroughly dry all affected structural materials, which will eliminate the chance of unwanted microbial growth. Do you have a state general contractors license? This is a question that applies only to water restoration companies that not only carry out the water mitigation (cleanup, extraction, demo, drying, sanitizing), but alto the re-construction (all repairs to deliver pre-loss conditions). If your contractor is only providing the mitigation, then they don’t need a GC (general contractors license), but if any repairs are going to be made, then yes, they need it. Do you have de-humidifiers as well as air movers (fans)? Although not every single flood damage restoration job requires de-humidifiers, it is only a fraction of them that are small enough in scope that don’t need them. Further more, if the company trying to earn you business doesn’t own any de-humidifiers then that would indicate that they are most likely not a serious or fully qualified water restoration company. Ultimately, the answer to this one should be yes if you are dealing with a reputable contractor. As long as your water loss claim has been approved by your insurance carrier, then any legitimate and certified water restoration contractor should send the final bill to your insurer using Xactimate. Sometimes you may have to settle the deductible with your contractor, but all other billing should be issued to your insurer. Any discrepancies on the bill should be settled between your contractor and the insurance adjuster handling the claim, without the involvement of the insured. How long will it take for the property to become dry? Generally speaking, the dry down process should last 3-4 full days for most residential flood losses. Unless there are abnormal or extenuating circumstances, you should be weary of unethical practices if your contractor is trying to justify longer than the 3-4 day time period for dry down. In most water mitigation bills, the drying equipment (air movers, de-humidifiers) are the main driver in the overall cost, so this is the area that dishonest contractors will try to inflate. The good people here at FastDry Restoration all hope that this information has been helpful to you and may someday be of use. The more you know about the flood repair process, the more painless and smooth it will go if you ever do have to deal with it. Thanks for reading. Welcome to the official FastDry Restoration Blog Page! We are very excited to start blogging and sharing all things property restoration related. If you’ve never heard about us, let us introduce ourselves. We are a water mitigation and mold remediation service that provides top notch services at fair rates, 24 hours a day, 365 days a year. We hope that you choose us to provide courteous and effective flood restoration services if you ever encounter water damage in your home or business. If you are the owner of Water Damage Tips by FastDry, or someone who enjoys this blog why not upgrade it to a Featured Listing or Permanent Listing?